Photo below: Current Biology, Stoeger et al. Koshik, an elephant at the Everland Zoo in South Korea, can speak Korean aloud. Here Ashley Stoeger and Daniel Mietchen record his vocalizations. 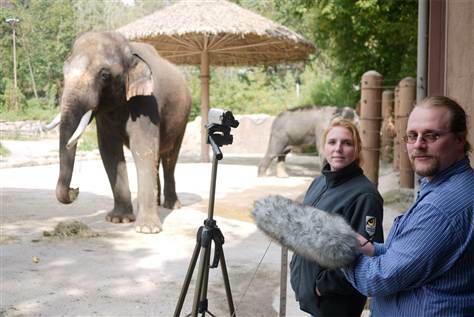 "A zoo elephant in South Korea can speak Korean out loud, researchers say. The pachyderm is capable of saying "hello," "good," "no," "sit down" and "lie down" — all by using its trunk to do the work of lips in a process scientists don’t fully understand. The elephant likely does not understand the actual meaning of what he says, researchers said. Past reports have suggested both African and Asian elephants were capable of vocal mimicry like parrots."